In this example we are going to avoid using Compiler Pass by injecting services tagged with a specific tag into another service. Our example implements Strategy Pattern. We have two consumer services and one console command. 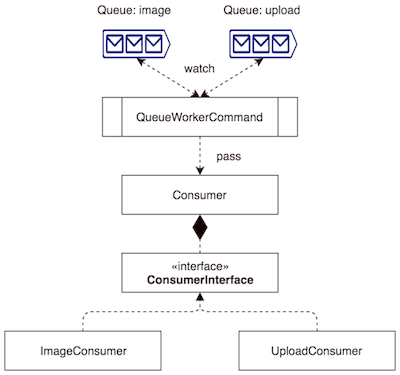 Console command watches messages in two different queues (image and upload) and passes them to main consumer (Consumer). The main consumer then passes messages to the relevant consumers (ImageConsumer and UploadConsumer) where they will be processed. The main aim here is not to create more than one command. // Grab the message from the queue. e.g. RabbitMQ, Beanstalk etc. Consumed message "I am the message" in queue "image". Consumed message "I am the message" in queue "upload".